Since we bought our camper I have been reading a lot about properly setting up our tow vehicle (TV) for towing our large-ish popup in a safe and stable manner. As one comes to expect of the Internet these days there seems to be way more opinions than facts out there. 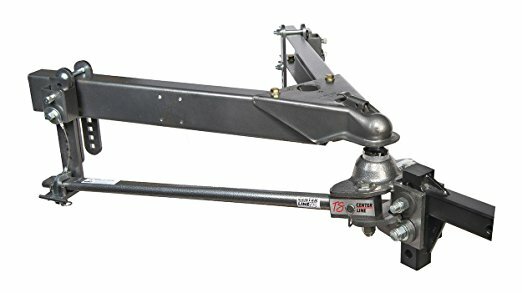 Anyways, I am moving forward with the advice that when the camper gross vehicle weight rating (GVWR) is 50% of your tow vehicle GVWR (or greater) that you should use a weight distribution hitch (WDH). Since I know the GVWR of the camper is just under 3900lbs and the GVWR of the F150 is 6800lbs, the math is pretty easy to do and a WDH is in order. I started out by using a Sherline tongue weight scale to get an accurate number for the camper tongue weight of 400lbs with a partially loaded camper. The factory specs say the dry camper tongue weight is 387lbs and with the amount of stuff I put into the camper this 400lbs measurement seems reasonable. Knowing the tongue weight helps me pick the correct hitch size to order, in this case a 400-600lb model should be sufficient. I have done a lot of reading and watching Youtube videos on the Equal-I-zer and Fastway E2 hitches and was planning to purchase one of the Fastway models until I found the Husky Centerline TS. The Husky is essentially the same as the other two but has a few advantages (in my mind anyways) that make it worth giving a try. First the Husky hitch includes the hitch ball which is installed and torqued from the factory. This is a big plus in the Husky’s favor. Second the spring arms are quickly and easily removable from the hitch head. The Equal-i-zer hitch has this feature as well but costs at least $150 more and doesn’t come with a hitch ball installed. When considering that 2″ hitch balls need to be torqued somewhere between 360-450 ft/lbs this makes a big big difference to me. Unfortunately the Husky manual says that the bolts that hold the hitch head to the hitch shank need to be torqued to 380 ft/lbs and I have confirmed this with a Husky technical support representative. So I will still need a rather large torque wrench to complete the installation of this WDH setup. To be fair, having the correct tools to make sure the hitch ball stays properly tightened will be a good thing to have in the future. Over the last two weeks I have placed multiple orders with Amazon for the Husky hitch and various tools. Sadly the first hitch that Amazon shipped to me was the 800-1200lb model. I say sadly because the shipping weight for this thing is 102lbs, which is a costly mistake for Amazon to make since they get to pay the return shipping. And sadly for me because I have to get it into the truck to take to the UPS store for return shipping. The replacement unit has already arrived from Amazon and this time is the correct model. The needed tools are also arriving as ordered. Something to note is that Husky does not list the correct tools at the beginning of the manual. First they state that you will need a 1-1/8″ box end wrench for the 3/4″ hex head bolts and nuts. While the bolt head is correct at 1-1/8″, the nut size is actually 1-1/16″. I have not determined if the tools I have will work yet or not. Second the manual states you need a “torque wrench capable of 380 ft/bls of torque” but does not list that you need the sockets to go with the torque wrench or what size they should be. Fortunately I already have a set of 1/2 drive sockets that should do the job. Otherwise I’ll be hunting around the local parts/tool stores this weekend trying to find the correct sockets.